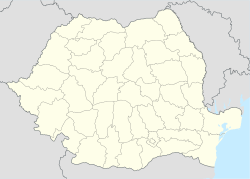 Crăciunelu de Jos (German: Christendorf, Hungarian: Alsókarácsonfalva) is a commune located in Alba County, Romania. It has a population of 4,392. It is composed of a single village, Crăciunelu de Jos. It also included four other villages until 2006, when they were split off to form Bucerdea Grânoasă Commune. ^ (in Romanian) "Crăciunelu de Jos", at the Erdélyi Magyar Adatbank's Recensământ 2002; Retrieved on April 16, 2016.